Large red brick house with central carriage way. Mitchell's four daughters, along with their cousin, Maie Ryan (later Lady Casey) were educated by private governess in Fanecourt's school room. Four of the five became writers. The Mitchell family sold Fanecourt in 1913 and later it was divided into eight flats and renamed Torrington. The house became the subject of a prolonged battle by residents when an application was lodged to build a 14 storey block of flats for Mercy Hospital nurses. 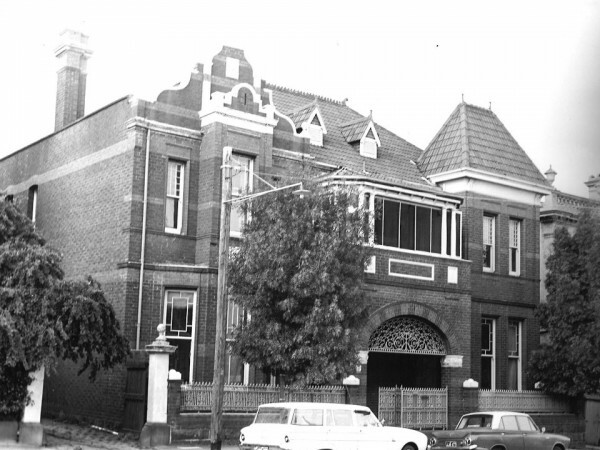 It was eventually demolished in 1970 to make wasy for the low rise Mercy Hospital car park, itself now also demolished in preparation for the building of an aged care facility. Sir Edward Mitchell was the son of Sir William Fancourt Mitchell, Victoria's first chief commissioner of police. He married the daughter of Dr. Alexander Morrison, principal of Scotch College for over fifty years. 1900-1903: Sisters of Charity. Fanecourt became the convent for the teaching sisters while the new Catholic Ladies College was being built in what became Cathedral Place. (The nursing sisters remained in their convent in Victoria Parade, Fitzroy, near St. Vincent's Hospital.) "As Fanecourt proved to be detrimental to the sisters' health, the building of the new convent began in 1902". 1915-1922: William Henry Croker. He was prominent in the racing industry, and bred many successful thoroughbreds at his stud, Woodlands near Tullamarine. He was a hightly respected steward of the Victorian Racing Committee and founder of the Oaklands Hunt Club.